Ben Calabrese is captivated by the action unfolding on stage; two star-crossed lovers, one on a table and the other on a chair, lean in for a passionate kiss when suddenly the table slips out from underneath. And so goes the unexpected nature of a show’s rehearsal and its focused director, who observes and takes note of it all. Rehearsing a scene from the upcoming production of “Eurydice,” actors Will Caldwell and Shannon Carroll, both 22, displayed an effortless chemistry while staying true to the old saying which demands that the show must go on. This play is the opener for SF State’s varied Spring 2013 theater season. The story is a modern retelling of the classic Greek myth as written by French playwright Jean Anouilh, and set in the 1930s. It tells the story of a musician named Orpheus (Caldwell) and an actress named Eurydice (Carroll) who meet at a train station, instantly fall in love and the depths they go to for everlasting love. In the original myth, it is love that takes Orpheus to the underworld in order to bring Eurydice back to earth after she had been fatally bitten by a snake. The catch is he should walk in front of her and never look back until they reach earth or else she would die again and be gone forever. In Anouilh’s version, a car crash claims Eurydice’s life, but the challenge remains. Orpheus must wait beside her spirit in the train station until sunrise and not look her in the face. With the stakes set high, Anouilh’s skeptic love story rolls into motion. To further convey Anouilh’s vision, he casted two extra actors Caleb Cabrera and Grace Ng, who mirror the narrative of the modern day Orpheus and Eurydice and represent the pair from the original Greek tale. Regardless of the play’s bittersweet themes and sometimes bleak tone, Calabrese hopes that the epic love story will resonate with the audience and that they will dare to accept love in all its imperfections. “Eurydice” is funded by the Players’ Club — SF State’s theatre arts student organization. Every fall, they select one production for the spring season out of a series of interviews and proposals from students all vying for the opportunity to direct their own show. “We decided to go with this show because it was inspiring, uplifting and moving all at the same time,” Gabby Battista, 21-year-old president of the Players’ Club, said. “We had a general consensus where we wanted everyone to believe in true love,” she said. The Players’ Club decision should come as no surprise considering Calabrese’s track record at SF State. He has been involved in at least 13 productions either as an actor, director, playwright or stage manager. In addition to directing “Eurydice,” Calabrese’s short play “La Cajita” has been selected to represent SF State for the Kennedy Center American College Theater Festival regionals next month in Sacramento. 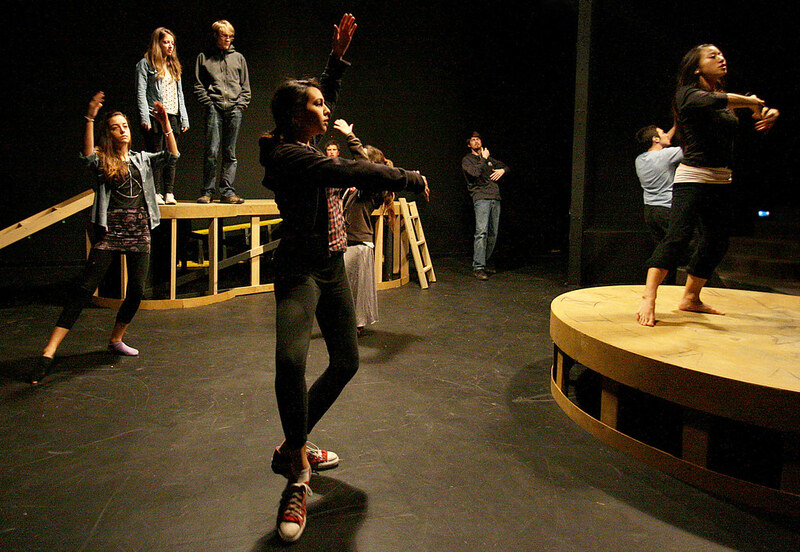 It will compete in the one-act plays category along with five other aspiring playwrights from neighboring schools. If chosen, it will move on to the national festival in Washington, D.C. in April. As excited as he is for the festival, Calabrese’s main focus is “Eurydice,” and his expressions ranged from head nods to smiles during the run-through. The cast and crew are equally passionate, as they too believe in the story’s vision. “I want people to look at this relationship and maybe examine their own,” Carroll said. With a love story encompassed in themes of death and disappointment, Caldwell advises audience members that this is not a show for the fainthearted. “Eurydice” will open Thursday Jan. 31 and run through Sunday, Feb. 10 at SF State’s Studio Theatre in the Creative Arts Building. It will be followed by Thornton Wilder’s Pulitzer Prize-winning play “Our Town” opening March 7 at the Little Theatre. The season will conclude with the wise-cracking antics from the puppet-driven musical “Avenue Q” opening April 25 at the Little Theatre.